Workplace DesktopAlso known as the Workplace Desktop app, and in the context of this documentation, simply "the app," Workplace Desktop is the software installed on a computer that is responsible for synchronizing data between the local drive and the cloud. operations can be paused or resumed at any time. When Workplace Desktop is paused, all Workplace activity is temporarily suspended. Make a selection from the expanded menu. The available options are 1 hour, 2 hours, 4 hours, or Until tomorrow. If you select Until tomorrow, Workplace"Workplace" describes the Autotask Workplace service in its entirety. operations will resume at midnight today. You may manually pause or resume Workplace Desktop operations on the Workplace Desktop Options window by clicking the Pause or Resume button. If you access the pause feature from here, Workplace Desktop will pause until midnight, then automatically resume activity. 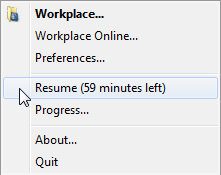 You may manually pause or resume Workplace Desktop operations on the Workplace Desktop Options window by clicking the Pause or Resume button.